Longer subscription plans are available. Platinum includes the full US physician database from the NPI registry (everything from carePrecise Gold), plus additional physician data, including practice groups affiliations, hospital affiliations, graduation year and more, with CP ListMaker targeting software. Gold is the basic healthcare provider database with CP ListMaker targeting software. System Requirements: Microsoft Windows 7 or later, 4GB RAM, Microsoft Office Pro or Microsoft Access 2007 or later. With CarePrecise Gold and Platinum software and data packages, you make your own targeted lists of physicians, PAs, RNs, and every other kind of provider associated with a medical office. And that includes doctors, dentists, hospitals, DME suppliers —just about any healthcare entity. Don't waste budget on expensive, untargeted mailing lists from list brokers. Use CarePrecise software and our always up-to-date data—updated monthly—to get physician marketing lists that boost sales and control marketing costs. It's a snap with CP ListMaker™, our acclaimed medical marketing list builder, and our complete U.S. Healthcare Provider Database, available together as CarePrecise Gold. With CarePrecise Platinum, you get our data on all US HIPAA-covered HCPs, plus physicians' practice group affiliations, hospital affiliations, graduation year and additional data on physicians and hospitals, along with CP ListMaker. Unlike the current physician information on the American Medical Association's Master File, which can cost tens of thousands of dollars and comes with stringent limitations, CarePrecise data is collected using advanced automation from the most authoritative sources within the federal government. No database is perfect, but our data doesn't come from hit-and-miss phone calling or surveys, or from screenscraping, and, unlike the AMA database, physicians cannot opt out of our source data. With our primary federal source, doctors are required by law to update their information within thirty days of a change, and we update our Master File every month, and pass that fully updated data along to you as a subscriber. Put the power to target your market right on your own desktop! You'll download our complete database of	5.8 million US	HIPAA-covered	healthcare	providers,	and you'll tame it easily with our user-friendly software, to make an unlimited number of lists of physicians and others by specialty, subspecialty, geographic area, even gender and Medicare status. You'll get more fields of data in our provider database than any other provider database available anywhere, including practice addresses and business mailing addresses, plus telephones, faxes and much more. 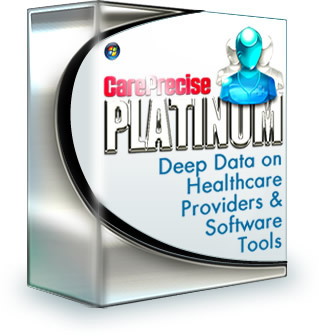 CarePrecise Gold and Platinum build doctor lists aimed straight at your customer profiles. After you've installed CarePrecise Platinum or CarePrecise Gold, the first step in making a targeted list is to decide what kind of healthcare providers you want on your medical marketing list. In this case, we're creating a list of doctors in a particular geographical area, who practice particular specialties. Choose the exact types of doctors you want in the Pick Taxonomy Codes box. "Provider Taxonomy Codes" are the official codes used by the healthcare inductry to identify kinds of healthcare providers. 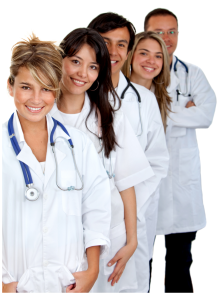 Select any or all of the physician specialties for our doctor list. You can limit your physician mailing list to a specific geographic area (or make several different lists, each in a different area). Select zip codes to include from the Pick Zips box. You can sort the zips showing in the box by zip code or alphabetically by city, and you can even filter to show only the zips in a particular state or county. To zero in on the specific zip codes you want, you can select a state and even a county in the little menus at the top of the Pick Zips Box. Then you control-click on the zips you want to include. This is also the place where you can filter to view and select only urban, rural or suburban zip codes, and even filter to view zip codes with particular econometric (wealth/poverty) profiles. There's also a Zip Code Lookup Tool and a Geographic Radius Tool . You could use the Geographic Radius Tool to make a list of physicians within, say, 5 miles of downtown Denver, Colorado, or within 100 miles of Tucson, Arizona. Now that you've selected the types of physicians you want on your list, and the zip codes you want to include, you can make changes on the View Criteria tab, and even save your criteria to use again later, or as the basis for a new list. Now it's time to click the Find Matches tab so you can take a look at the doctors on the very specifically targeted physician mailing/telemarketing list that you just built! On the Output Lists tab you can further refine your lists, choose which fields to include, customize in various ways, and export your lists for use in Excel and other software, or to send to your mailing service.